This hasn’t been a priority of mine at all, so right now the first draft script of the MOTHER 1 part stands at about 15%. It’d be easy to finish this thing quickly, but I want to take my time with it. I don’t feel like there’s as much a rush, since people can play the NES ROM any old time, and my EarthBound Zero easy mode patch does what the Easy Ring in this M1+2 translation does. But it’ll get finished eventually. For now, I decided I’d let people know about this neat little thing that may or may not get included with the translation patch. Basically, the NES could only show so many colors at a time, but the GBA can show a lot more. In the MOTHER 1 GBA port, the programmers just set everything to look like the NES version, but in technical terms, it’s completely possible to use lots more colors for everything. It’s pretty cool stuff. I’m not sure if we’re going to actually do this or not, or if we’ll include it with the main patch. If we do include it, we’ll either have it as an option you can toggle on or off or as a separate patch. So if you want a super true-to-the-original experience instead of this fancy colorized stuff, you’ll be able to. Theoretically, this same concept can be applied to all the graphics, not just the enemies, so it might be possible to make an upgraded-graphics version of the game while keeping everything else intact. Kind of like how original GameBoy games were upgraded to have more colors on the GameBoy Color and Super GameBoy. Another simple thing that COULD be possible is auto-wins. I don’t know if we’ll actually mess with that, but if we do, it’ll again be an option you can turn on and off. I get the feeling we won’t be doing this particular idea though. BTW, I’ve played through to Magicant with the Easy Ring on, and the game didn’t seem annoying or tedious at all. I didn’t have to stop to level up at all, and it was really fun and everything was a breeze. I think people will like this patch, whenever it’s done. POLL: Would you use this graphic upgrade option? That looks so awesome! We may have no need for your EBZ Remake Hack after this! That’s actually kind of my hope 😛 This stuff will be a lot easier than hacking the EarthBound ROM, which is basically a pit of deadly snakes in binary form. The colors on that new oak thing look kinda muted. I think I’ll be playing with original graphics. 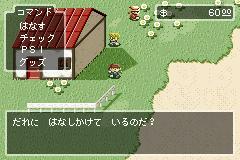 It would be really awesome if the game had a major graphics overhaul, akin to MOTHER 2’s graphics. I’m sure it would be difficult, but the work you’re showing us looks awesome. I thought of an idea… when playing EB0, one of my main gripes is that the controls seem kinda laggy when walking around. Compare how super-responsive EB’s walking around is to EB0’s walking around. Big difference. It would be sweet if the controls felt more responsive, if that’s possible. In Mother 1+2, Mother 1 has pretty much the same style of free walking as Mother 2, as opposed to the grids of the original. That would be amazing. To me, the original NES shading always kinda gave a “scary” aura to the enemy sprites. I would appreciate this kind of update, but it should probably be done last so a patch without the graphical updates could be made for those who want it. I think it is an absolutely awesome idea and I would love to have it on the patch. As long as like you said people can still have the option to turn it “on” or “off”, I can’t think of a reason why people wouldn’t want it included. I for one would love to play through it twice using the original graphics and then the updated ones, to me options like that really adds length to the game and would make it a different and unique experience each time. Gah! I don’t want to Emulate, but you are tempting me. How far can you go with the graphics hacking? Would JeffMan be able to alter other things in Mother 1? Anyway, this is a really cool idea. Maybe try using Mother 3 sprites as a tech demo? Like, just to see if it works? One question is there any way to change to battle mechanics so that if one character kills an enemy then another character won’t miss with their next hit but rather automatically attack another character? It’d be nice, but it’ll probably be pretty hard to add in something like that without the source code. I’ll probably look into it though. Woah, you wouldn’t be taking any help for this, would you? Because i’ve done some revamps of earthbound sprites before, so I might be able to help. Hey, the fact to switch between original and rewamped would be absolutely awesome! I like the original ones. if you remake the battle sprites, i’d say to remake the out side sprites too. a good idea is to make different versions for different people. Looks great, you forgot one poll option, playing the game through with each. An EBzero where grinding is no longer an issue. An EBzero where your characters don’t try to kill enemies that are already slain. I think it would be pretty decent! Even for a modern game, EBzero would rock! You said in a prev. entry that you were rewriting the script as the old one was very dry. Does this mean the new script will actually be humorous? Could you give like a comparison between old and new, if you aren’t too busy? Dang Mato, that is sick. I can’t wait! Yeah, the idea with the hits targeted at dead enemies just being transferred to other enemies is fantastic. That was a major frustration when I played. I M O, changing the graphics seems like a lot of unnecessary effort when that and all kinds of other changes could easily have been made if Itoi wanted to. Millhouse: Two and a half out of four ain’t bad? Nah, I would play with the low res graphics. Firstly, It is a translation, not a remake. Also, the graphics would contrast to the ugly in-battle backround. It would be cool with the option, as long as it isn’t neccessary. If you have enough space on the ROM, totally go for it. I say go for it. Honestly, this is pretty awesome and could open up lots of hacking opportunities for PK Hackers. I would love to play it if you fully upgraded the graphics; plus, except for the battle system and music, you would have your remake project. I would probably play it both ways. Just make sure to allow the player to keep it with original graphics as well. I’m assuming you’ll be releasing the MOTHER 1 translation long before the MOTHER 2 translation; would it be too much trouble to include menu translations with MOTHER 2? I want to replace my RPGOne translation with this one once it’s complete, but I really love having a menu patch. If you’re going to do this, please do it right and do not use Earthbound’s graphics. That would be just wrong. The games are different, and they should be seen as such. I’m all for it, just don’t copy and paste Earthbound grahphics. Do it, it looks awesome. I say give players an option to have the updated textures or not. The thing is, Mother 1+2 tried to emulate the two titles the best they could. Hacking the textures kinda removes the legitimacy. If you are going to do a texture hack, I say DO IT AS A FEATURE THAT YOU CAN TOGGLE ON OR OFF. Or at least release two patches. I’m pretty sure that a lot of the data on the cartridge is just blank space, at least for Mother 1. And if you’ll do the texture, why don’t you try inserting EarthBound’s original music into into its Mother 2 memory, to see how the tracks would sound on the GBA instead of the low-ish quality versions it already has? Master of Ramen: Did you read the post fully? If you can add color, does this mean that color battle backgrounds will be possible? Or am I getting ahead of myself? In the EarthBound Zero Easy patch the backgrounds had stars flying in the background, so it’s possible, but it most likely won’t have different BGs for different enemies like EarthBound and Mother 3. Actually, you’re thinking of a different, much older patch. The Easy Patch doesn’t have anything added. Anyway, no, I don’t think battle backgrounds would be possible, at least nothing like EB’s or M3’s. I probably won’t even try messing with that though. I’m pretty sure that the way the game is set up, there aren’t any available layers to do background stuff with. I can’t even remember for sure if the enemy graphics are actual sprites or not. They may actually be the background layer itself. My dream project was the Mother-Remake project using the Earthbound Engine. Is this where you are going with this…or does it stop at just a few sprites? If it does will there ever be movement to pick up that project again? Thanks in advance. I’d help too! With funding if necessary. I’ll discuss the EB0 make project in another update sometime, but here’s something that also links to further clarification. your taking way to long withthis project that you said was “simple.” It would be faster for me to learn jappanese and beat the game then wait for you to make this patch. I’m sorry that I’m not as good a monkey butler as you had hoped. But I would recommend learning Japanese anyway. It seems like my post got completely forgotten, so I’ll just try again. Any chance of having a M2 menu patch included in this hack? Yeah, I’ll probably do something along those lines. It might not be as thorough as that other patch that also translates some of the battle text, but it’d be along the lines of the Mother 3 menu patch at least. It’ll probably be stuck with an ugly all-caps font though, like all the other patches. Japanese screenshot of a 16-bit version of MOTHER that appeared on Starmen.net a while back, before any of the official MOTHER 3 screenshots were released. It looked almost EXACTLY like MOTHER, only with enhanced colors. If anyone still had a picture of it, it would be really neat if you could also upgrade the field graphics to look like the graphics in the screenshot. And thanks for the fantastic MOTHER 3 translation, you are AWESOME. Like I mentioned, it would theoretically be possible to upgrade almost all the graphics in the game, but it might be a lot more work than is worth it. It’d be neat, though. Super Mario All-star-izing the graphics? That would be awesome! Would it at all be possible to include some form of psychedelic backgrounds in the battle scenes? Also, would it be at all possible to upgrade the music? I heard some of the 16 bit songs you were planning on using for the EBzero remake. Very earthbound-esque. Wow this is amazing! Cant wait for this! Just a thought – what if you did the same thing to Mother 2? Like, Mother 2 with 8-bit colors! That’d be fun to imagine… Though seriously, I think that, when or if you get around to Mother 2, there really should be an option to darken the colors to make it like the SNES game. I felt the GBA made it too bright even though there are some other GBA ports that had an option to adjust the brightness to your GBA screen. On a side-note: I see you’ve gone with Territorial Oak! 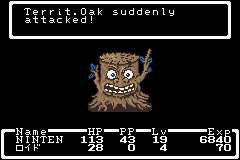 I wonder what the normal Woodoh enemies would be, if they’re remain Woodohs or have an EarthBound-ish name… Like Li’l Oak or Non-Lethal Oak. The enemy names right now are very unfinished so what you see there probably won’t be final, but I’ll of course do my best to make everything match as much as I can between this and Mother 2/EB wherever there should be a connection. It’ll be tough in some cases though – I’ve already expanded enemy names as far as they’ll go without reorganizing the entire battle screen. captain_falcon: I mentioned it before, but backgrounds probably won’t be possible – technical-wise I think the enemy graphics might be the background layer themselves. no! keep the original graphics! I’m all for a graphic update, especially since I’ve already played through the NES release. you know i love the updated graphics idea, but i’d love to put this on my flash cart…. and these extra graphics could potentially make it too bit to fit on my 256 cart. 🙁 that would be tragic. @jojjy – There are no “extra” graphics, just changed graphics. It’s still a GBA game using GBA data, the original version was just colored it to look like a NES game. With the hacked graphics instead of telling a set of pixels to display as gray, gray, gray, gray, gray, it’s now being told to display as dark gray, gray, gray, light gray, white. …this is how I understand it, anyway. Someone please correct me if I’m wrong. 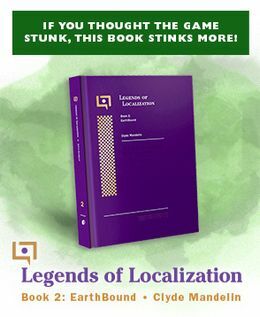 Ahh Mato, it is good to be posting in translation blogs again! Sometimes the build up is more fun than the end result. Of course MOTHER 3 is loads of fun, but anyways I digress. If this were to be implemented as a turn on/off option, I would say take it to the max and update the graphics of everything. It would be pure win. However, if it was one of those things that you had to choose between “do we want it at all or no?” then I would say maybe just the battles should be updated. Whatever you do though, at least add some psychedelic drug trippy backgrounds, eh? Continue you’re work !!! It’s really great !!! 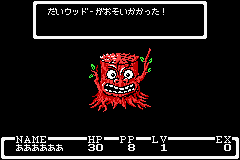 I’m thrilled about the translation, but I feel like changing the way Mother 1 looks could change the feel of the game. I’m really excited about the opportunity to play EB0 in its fullest glory. The tile-based movement and dry script of the NES EB0 was not very appealing. # SMAAAASH!! is always displayed in green. In the Famicom version it would be one of several colors. # Enemy and ally attack sounds are mixed up. Could be a mistake. # Giegue’s attack sound is a little bit off. 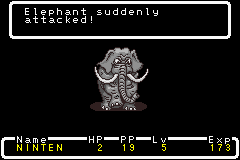 and the censored enemies, both in NES and SNES style? Having beaten MOTHER 1 already, I’d have to say it’d be totally awesome if you re-did the graphics and such alongside the translation. Im usually against emulation, but I’d probably do so if it meant being able to play a totally-re-imagined MOTHER. Mato, since you’re in the neighborhood of changing the graphics around on this, what are the odds you could make the characters show their faces in battle like in MOTHER 3? I’m starting to think that if we do through with this, we’ll have two separate patches for technical reasons. But I’m not sure yet. Hendricks266: Not sure what can be done about the things you listed. I haven’t decided whether or not to uncensor the graphics, but if we do this graphic upgrade thing then I’ll probably leave the 8-bit graphics 100% as-is and have the colorfied versions be uncensored. Lothis: No, that’s not a possibility. It wouldn’t even really make sense design-wise. The half-remake with upgraded monster graphics but normal everything else looks kinda weird. I wish it was easier for you to finish that EB0 remake hack, as it looks AWESOME! 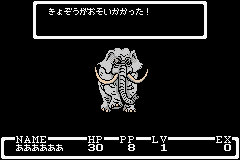 For now, though, I’ll be reasonably happy if you finish the Mother 1 from 1+2 translation at all! I hadn’t thought you’d take this long since you said it’d be quick and easy. It’d be nice if you were able to apply that Earthbound graphical update to the M1+2 rom, which has been something i’ve loved since Mario All Stars. But honestly at this point it doesn’t matter. Just best of luck whatever you decide to do. Earthbound 0 is just… ugly. It needs a remake, badly. Can you increase Ana’s offense stats? Those stats were TERRIBLE. Ana’s more of a PSI person IMO anyway. Will the overworld’s sprites be updated too? So, after reading this I was kinda hoping for some overworld enemy sprites and not just random battles. What are the odds of that happening? I figured as much, I guess I have high hopes though. I’d keep the old sprites. For that classic NES feeling. If there is an option for updated graphics, I wonder if those brown shadows will be cleared up. I know it was taken from the previous project, but personally, it looks odd against a black background. So… Any news on the M1+2 translation front? I presume you didn’t work on it any further, right? How Are the chances for not-hitting-dead-enemies in this patch? It would be fascinating to have an EB 0 remake. Definately do it, it would be very cool. The last time you played Mother 1 was in 1999?! What the heck?! Man, EB Zero doesn’t get any respect. People think that you can just skip it entirely and go to Mother 2, but they’re wrong. EB Zero has a darker story than Mother 2, and is pretty deep once you get into it. Definitely updating the graphics would be a fantastic choice. So long as they’re not changed entirely, I think it would look really cool. Maybe I will finally get around to playing a Mother game besides EarthBound. Mato thank you for bringing the joy of the Mother series to the world. I REALLY like the idea of this update. As long as the toggle option is there, I think it’s ridiculous to protest this type of thing. I love Mother as much as its sequels, but I’ve only played it in Japanese, so even without the graphical updates I’m excited to have a faithful translation (and a portable one, at that!). I truly hope this project doesn’t disappear, even if it takes a while. Has anyone else noticed that the enhanced Big Woodoh’s leaves are blue now? what about trippy backgrounds? is that possible? I like it! But it would be nice if there was an option to choose between the 2. I think for this that two roms would be available for download. One with updated graphics, the other with the original NES ones. Woah, how have I not seen this article before? This concept, combined with a less-sucky audio engine would make THE definitive version of the game.